Posted on May 10, 2013 at 3:13 pm by kcarr1@illinois.edu. 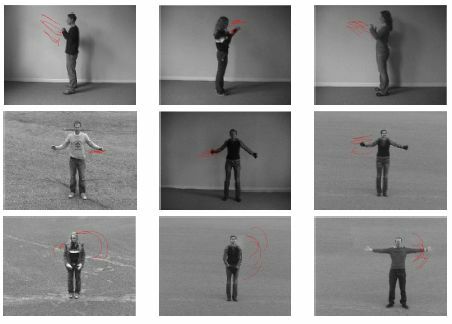 Action recognition is an important computer vision problem that has many applications including video indexing and retrieval, event detection, and video summarization. In this paper, we propose to apply the Fisher kernel paradigm to action recognition. The Fisher kernel framework combines the strengths of generative and discriminative models. In this approach, given the trajectories extracted from a video and a generative Gaussian Mixture Model (GMM), we use the Fisher Kernel method to describe how much the GMM parameters are modified to best fit the video trajectories. We experiment in using the Fisher Kernel vector to create the video representation and to train an SVM classifier. We further extend our framework to select the most discriminative trajectories using a novel MIL-KNN framework. We compare the performance of our approach to the current state-of-the-art bag-of-features (BOF) approach on two benchmark datasets. Experimental results show that our proposed approach outperforms the state-of the- art method  and that the selected discriminative trajectories are descriptive of the action class. This study is supported by the research grant for the Human Sixth Sense Programme at the Advanced Digital Sciences Center from Singapore’s Agency for Science, Technology and Research (A*STAR).